This week B's rear has been feeling very wobbly. I thought damn rear wheel is buckled or something so I checked it. Found the marathon plus tire I had on had lumps in. It's a common problem with Schwalbe Marathon Plus tyres I've later found out but it's the first time this has happened to me so badly. My local bike shop Londonfields Cycles tried reseating the tire but it was too far gone to be saved. It was pronounced dead at the scene. So they replaced it there and then under warranty no charge even though they didn't fit it but I bought it from them a few months ago. Now that's what I call customer service. 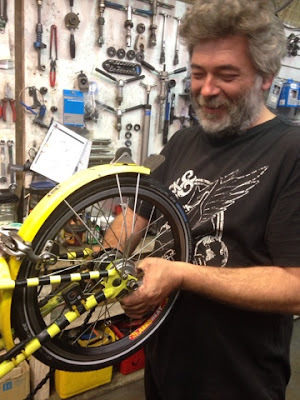 Keeping it local with independent bicycle shops is the way to go. Londonfields Cycles.